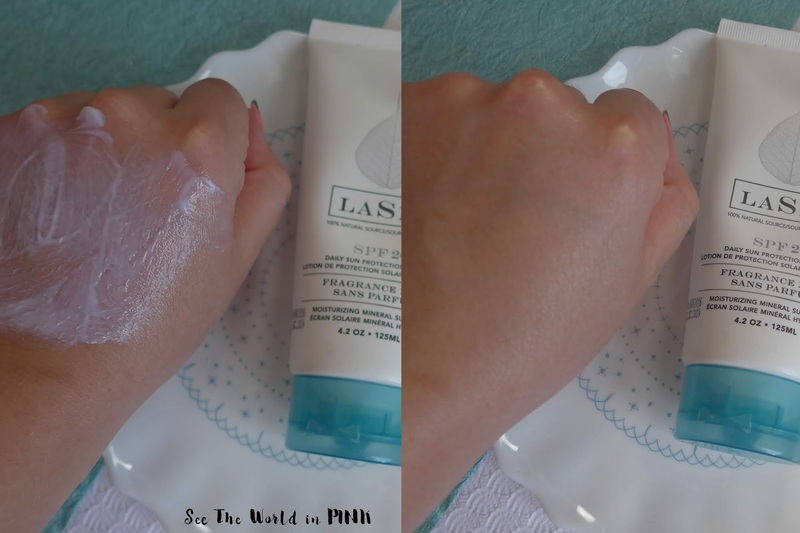 Skincare Sunday - National Sunscreen Day with LaSpa Natural Suncare Products! It's May 27 and that means it's National Sunscreen Day!!! I'm a pretty strong supporter of daily SPF - I personally spent my teen years and early twenties doing some serious damage to my skin (we're talking laying out in the sun with baby oil on and tanning 3 times a week in a tanning bed...), so now I am constantly trying to reverse and prevent any permanent damage that I may have done! It's so important to apply SPF everyday (I always do at least to my face, neck and arms - anything that is exposed, even just if I'm driving). The most important thing to look for is a broad spectrum sunscreen - if it doesn't say this on the packaging, it will not protect you against UVA rays, which cause premature aging and sun spots! As much as I am particular about applying SPF, I don't think I have ever actually used a mineral sunscreen before! LaSpa describes the benefits of a mineral sunscreen as "Sunscreens use either a physical or chemical filter to protect your skin from the sun’s rays. Zinc Oxide (as used by LASPA) and Titanium Dioxide are natural mineral sun blocks that sit on your skin and stop both UVA and UVB rays from penetrating your skin. Chemical sunscreens use synthetic chemicals to reflect the sun’s rays after they have penetrated the skin’s surface." Also, the benefits of a zinc-oxide based SPF is that is it provides a broad spectrum protection against UVA and UVB! Also, where chemical filters take about 20 minutes to come in to effect, this sunscreen is effective immediately! LaSpa is a Canadian Natural Suncare line and their products are 100% naturally sourced with plant based ingredients, minerals and essential oils . Their products are clinically tested, and are hypoallergenic, chemical free, fragrance free, paraben free, gluten free and nut free - which makes it ideal for all skin types! 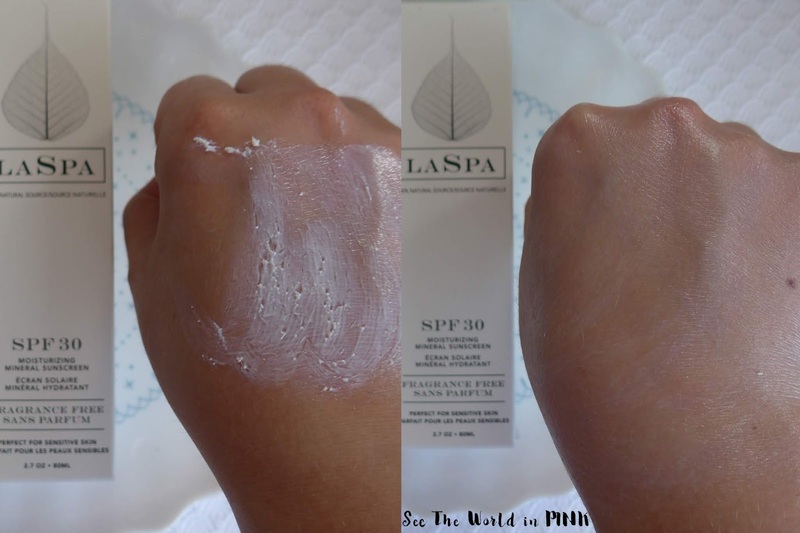 *LaSpa Moisturizing Mineral Sunscreen SPF 30 ~ $40.00 CAN. Light and translucent, this all natural Zinc based sunscreen lotion is perfect for protecting and moisturizing sensitive skin. Used as a daily regimen, it counteracts the aging and damaging affects of the sun rays and uses antioxidants to protect your skin. This is meant for the face and neck and also says it's perfect for sensitive skin! I'm also glad the website mentioned that because this is a mineral sunscreen, it will be a little grainy (because of the zinc oxide), but they will smooth out when warmed up and applied to the skin. Because when I first applied this, I was wondering why it was so grainy! This was a great daily face and neck sunscreen. It was super gentle to apply, absorbed well and did not clog my pores at all! It does take a few minutes to fully absorb and had a slight white-cast (not as much as in this picture!) I have tried this under foundation and alone and I will say that I prefer it on non-makeup days. It is really great then - it does leave the skin really moisturized with the slightest sheen. I find my foundation gets a little slippery and doesn't sit as well over top of it. *LaSpa Daily Sun Protection Mineral Sunscreen SPF 20 ~ $44.00 CAN. Light and translucent, this all natural Zinc based sunscreen lotion is perfect for protecting and moisturizing your face and body. Used as a daily regimen, it counteracts the aging and damaging affects of the sun rays and uses antioxidants to protect your skin. This product is much less grainy than the SPF 30 - this is such a great body moisturizer! You can use it comfortably on the face as well; but, I prefer a bit higher of an SPF for my face! This sunscreen absorbs super well and leaves no white-cast at all! It doesn't leave the skin feeling greasy at all. And I've tried it out in the sun and it works - no burns or anything! I really like this! 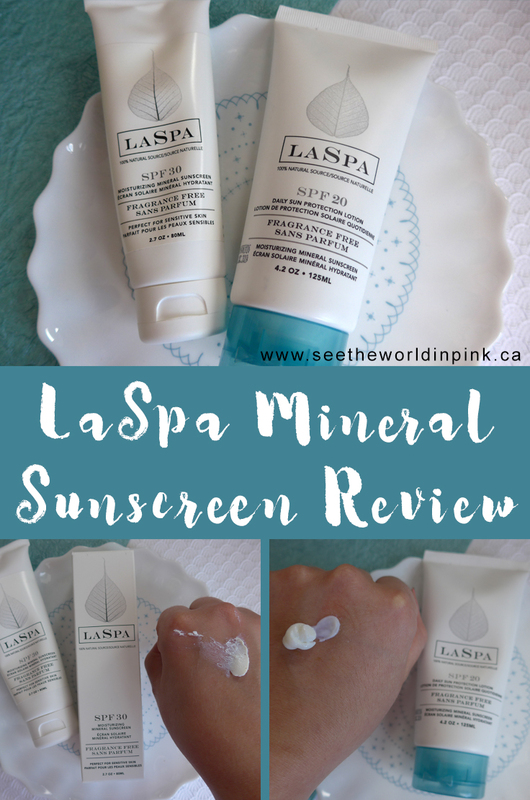 If you are looking for a natural, mineral sunscreen - I would recommend you check out LaSpa! I love that they are a Canadian company and I really enjoyed both of these sunscreens! Both worked well on me and are gentle on my skin! May 2018 - Monthly Favorites! May 2018 - What I Bought This Month! Manicure Monday - Green and Gold Foliage Nails! Manicure Monday - Leopard Print Nail Art! April 2018 - Monthly Favorites!